Mesenchymal stem cells—adult stem cells that are constantly renewing our bone, cartilage, and muscle—can be stimulated by a gentle massage to release calcium. Bioengineers at UC San Diego published their findings in the February issue of eLife and their work has been recently featured online in BioTechniques. Understanding how mesenchymal stem cells respond to physical forces in the body, such as blood flow or exercise, is important for a variety of diseases ranging from diabetes to spinal cord injury. Research led by Yingxiao (Peter) Wang, associate professor of bioengineering, shows exactly how pushing and pulling the outsides of these cells can signal changes inside them. For example, a gentle tug on the outer membrane of these cells opens up channels to release calcium ions stored within the cells. This last month, students and teams from the Entrepreneurism and Leadership Programs competed in several citywide, statewide and nationwide business competitions, and collectively, two student teams and two graduate students took home over $45000 in cash prizes. UC San Diego student teams ByStanders to Upstanders and Open Viral Load (previously named VivaScope) each won $10,000 of award funding for their projects from the San Diego Social Innovation Challenge. Graduate student Alex Phan won $2,500 for placing in first at the UC San Diego Grad Slam and $1,000 for placing in third at the first UC-wide Grad Slam competition. And, graduate student Aliaksandr Zaretski took home $25,000 cash and $20,000 in equity for receiving first place at Chapman University’s California Dreamin’ nationwide entrepreneurial contest. The San Diego Social Innovation Challenge is an annual competition hosted by the University of San Diego and their Center for Peace and Commerce. The competition aims to promote, guide and support student-driven ideas to launch or contribute to social enterprises, and has several rounds of idea labs and perfecting project pitches and business models. The Social Innovation Challenge had over 100 project submissions from San Diego university students and three rounds of challenges and project eliminations. For the final award ceremony, the remaining eight USD teams and eight San Diego-wide teams gave 90-second pitches in front of a live panel of judges. Of those eight San Diego-wide teams, four teams came from UC San Diego. After making the final pitch competition, Global TIES team Open Viral Load partnered with Engineering World Health, another UCSD finalist team of the Social Innovation Challenge, deciding that it would be beneficial to move forward in the competition together. The teams presented one pitch on their collaborative social venture and received $10,000 to fund their projects that focus on expanding the access of HIV testing. mystartupXX team Bystanders to Upstanders (B2U) also took home $10,000 for their application to encourage and gamify volunteer work. Graduate student Alex Phan took first place at the UC San Diego-wide Grad SLAM 2015 and third place UC-wide Grad Slam competition. Both competitions challenge graduate students to present a “TED-like talk” that can explain their graduate research to a general audience and award cash prizes. As the first prize winner at the UC San Diego Grad SLAM 2015 competition held last month on April 14, Phan was chosen to represent UC San Diego at the UC-wide competition in Oakland. 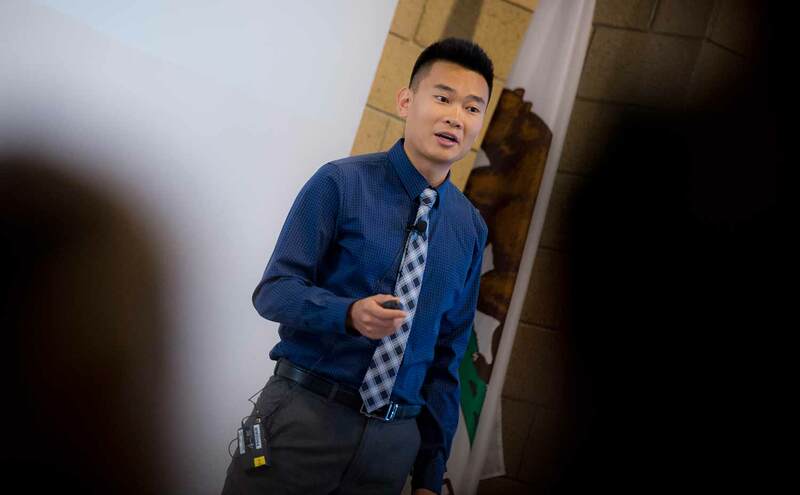 Phan went against 9 other graduate students from the other UC schools and took home third place for his presentation on how an intraocular pressure sensor can better detect and understand glaucoma, an eye disease that affects over 60 million people worldwide. After completing his undergraduate degree in Bioengineering at UC San Diego, Phan is now currently pursuing his Ph.D in Mechanical and Aerospace Engineering. Phan has also completed the von Liebig Entrepreneurism Center’s NSF I-Corps Program in October 2014, where he was able to combine his background in engineering with his interests in entrepreneurship. Earlier this year, Phan took home first prize at Entrepreneur Challenge’s Elevator Pitch Competition. 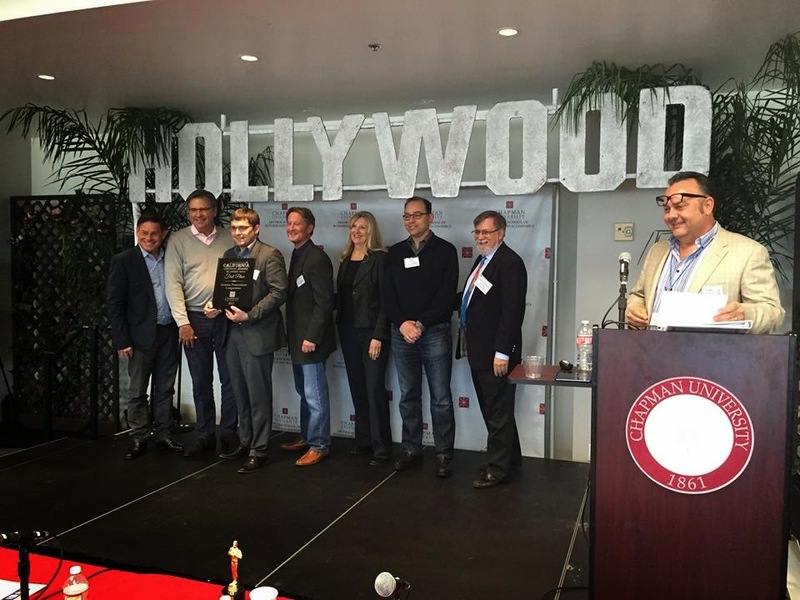 Nanoengineering graduate student Aliaksandr (Alex) Zaretski represented UC San Diego at the 2015 California Dreamin’ Entrepreneurship Conference and Competition and took home $25,000 in cash, $20,000 in equity and first prize in the overall competition. The annual competition, hosted by Chapman University, draws students from the best business and entrepreneurship programs from the United States and the United Kingdom. 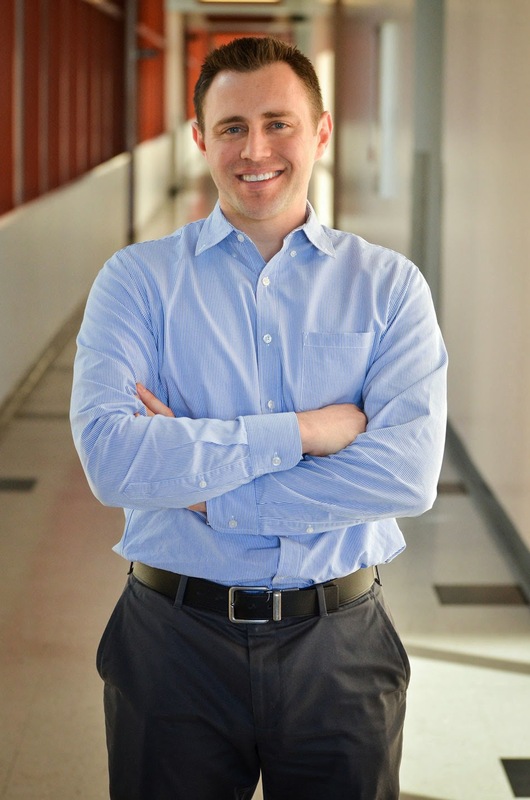 In 2013, Zaretski took home first prizes at the Entrepreneur Challenge at UCSD’s Elevator Pitch Competition and their $100K Business Competition with his company, GrollTex. GrollTex has an innovative technology for the synthesis of large-area graphene and has been an impressive startup success. Zarestski was awarded the von Liebig Entrepreneurism Center’s Department of Energy Fellowship and the National Science Foundation’s Graduate Research Fellowship last spring, and GrollTex recently accepted investment from the Triton Technology Fund and is in talks for a large-scale investment from another venture capital firm. Our students show us time and again that passion and hard work don’t go unnoticed. Congratulations again to these students for their continued achievements! Sarah Meiklejohn, an alumna who earned a Ph.D. in the Department of Computer Science and Engineering at the Jacobs School, has won the 2015 Chancellor's Dissertation Medal. She is now an assistant professor at University College, London. 1. Impact: The results in Sarah’s thesis have shaped government policy. The methods in the thesis have been used to track cyber-criminals. The thesis has received significant media attention (NY Times, Washington Post, radio, TV, ...). 2. Intellectual and technical depth: The thesis introduces an innovative new experimental technique to track Bitcoins that was used not only to obtain the thesis results but is now used as a key forensic tool by law enforcement. 3. Independence: Unlike many theses, which write up group projects, this one was entirely Sarah’s work. She alone conceived the idea and methods and pushed it through from algorithms to reality. In my 20 years of experience at UCSD, I would say that a thesis with one of the above elements is rare. To have all three in the same thesis is unique and extra-ordinary. Read our story about Meiklejohn's work here. Meet Tinker the Robot. UC San Diego mechanical engineering alumnus Kay Yang created him to teach and inspire young children to play with robots. Tinker the Robot is designed to appeal to both girls and boys – complete with an LED heart and motorized tracks – and to break down the process of coding and hardware. The majority of programming is logic, says Yang, and once you work out the logic, it’s easy to insert the programming language. Because Tinker uses Arduino-based code, kids who graduate from using the cards can plug him into the computer and reprogram him using C Programming. Tinker can also be an art project. Kids can draw on most of his hardware, giving them the opportunity to use their imaginations to make Tinker their own. He also comes with a downloadable lab notebook, designed to expose a child to scientific note-taking early on. As a little girl, Kay loved taking things apart and learning how they worked – except electronics. She couldn’t understand how an electronic circuit could bring an object to life. It wasn’t until she came to UC San Diego and enrolled in mechanical and aerospace engineering professor Nate Delson’s Introduction to Engineering Graphics and Design (MAE3) course – where students design and produce robots from scratch for a competition – that she began to understand how electronics and code work together. As Director of UC San Diego’s Mechanical Engineering Design Center, Nate Delson believes in project-based learning. To that end, MAE3 has recently incorporated 3D printing into its curriculum. Yang says she felt empowered to create something that would expose young children to electronics – that’s where Tinker comes in. “Now is such a great time for makers,” said Yang. “I was able to purchase a 3D printer and I’ve been producing all of my prototypes with it,” said Yang. Yang hopes to be able to begin mass production as soon as possible – but to do that, she needs your help. You can back this project by visiting Yang’s Kickstarter page here. “We want to get this off the ground as soon as possible – our children are our future engineers, and I really believe Tinker can inspire them to be innovators,” said Yang. Tinker the Robot will be available exclusively on Kickstarter from May 4-June 4, 2015, with the first shipment to customers in late 2015/early 2016. Drew Hall, assistant professor of electrical and computer engineering at the Jacobs School. Drew Hall, assistant professor of electrical and computer engineering, has been awarded a $120,000 seed grant from Cal-BRAIN, a California initiative aimed at revolutionizing our understanding of the brain. Hall’s project will explore using magnetic nanoscale sensors, similar to those used in hard disk drives, to detect brain signals. These magnetic nanosensors provide an alternative to conventional brain monitoring methods, whose lifetimes are limited because of scar tissue formation. Applications of this work will increase the lifetimes of neural implants, which will ultimately lead to more effective, low-cost treatments for brain disorders. “There is a strong need for treatment methods of neurological diseases,” said Hall. The World Health Organization estimates that more than 50 million people worldwide suffer from epilepsy, and dementia continues to grow at the rate of 7.7 million new cases per year. Currently, most brain monitoring methods measure the ionic current in the brain by making direct electrical contact with neurons (brain cells). This contact causes scar tissue to form around the electrodes, muffling the neural signals over time. Hall proposes measuring the magnetic field around the neurons instead. As a result, the magnetic nanosensors avoid direct physical contact with the neurons and are less sensitive to scar tissue formation. “I’m excited about the team that we have put together to tackle this high-risk, high-reward research,” said Hall. The team is also led by Eric Fullerton, nanoengineering and electrical and computer engineering professor and director of the Center for Magnetic Recording Research, and Vikash Gilja, assistant professor of electrical and computer engineering. Cal-BRAIN (the California Blueprint for Research to Advance Innovations in Neuroscience) is a statewide project jointly led by UC San Diego and the Lawrence Berkeley National Laboratory that was signed into law in June 2014. It is the California complement to the federal BRAIN Initiative announced by President Barack Obama in 2013. The 16 projects that were selected by Cal-BRAIN focus on developing new technologies to advance our ability to monitor and analyze brain activity. More information can be found at http://cal-brain.org/ and on the UCSD News story here. Hall also received an NSF Engineering CAREER Award in March. See story here. Every year, the Gordon Engineering Leadership Center packs a room full of innovators to brainstorm the implications and uses of an emerging aspect of engineering. 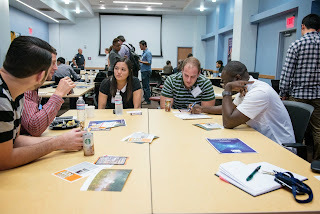 In the past, the Think Tank has drawn academics, innovators, and professionals from all industries to gather and collectively brainstorm on topics such as cyber security, cloud computing, automotive and avionic systems engineering, and the energy crisis. For their sixth annual Think Tank, the Gordon Center presents “The Future of Digital Health” and invites you to learn about how the use of technology can revolutionize healthcare on May 15 and 16. The event welcomes those who want to participate in an engaging space and explore both the opportunities and the challenges of integrating technology with health care. Some confirmed speakers include Director of Qualcomm Tricorder XPRIZE Erik Viirre, President/CEO of Cambridge Life Science Strategies Cleland Landolt, Director of Nursing Innovation - Kaiser Permanente Dan Weberg, Senior Manager of Global Technologies and UCSD Alum Wilson To, CEO/Founder of Linked Objects Gioia Messinger, and our very own Bioengineering Associate Professor Todd Coleman. 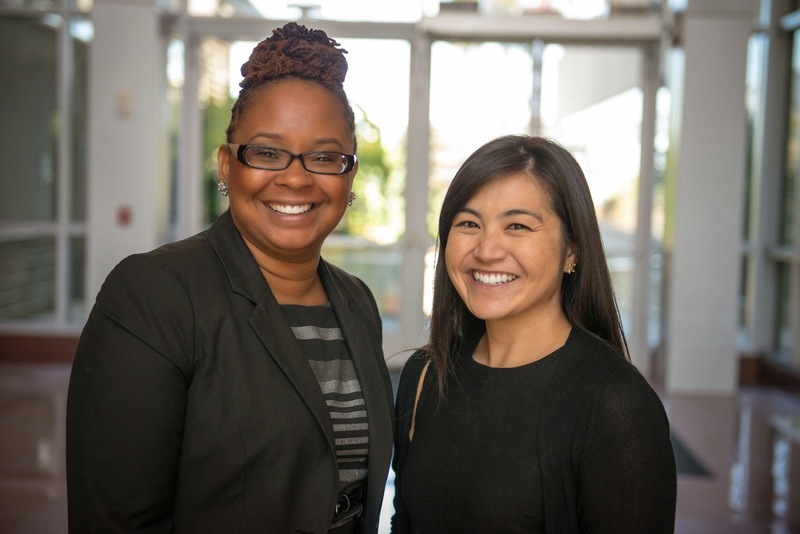 Coordinator Kara Fukumoto Bayani pictured left. Neil Gandhi, Gordon Fellow and Bioengineering Class of 2014 graduate, coordinated this year’s Think Tank on digital health with guidance from Dr. Williams and Gordon Center Program Coordinator Kara Fukumoto Bayani. Gandhi explained that from improving data analysis to diagnosis, technology will have a sure impact on healthcare. He explained that digital health is about applying what we know how to do with mobile devices, connectivity and big data analytics to improve access to our health care system. And the Think Tank will challenge participants to think of those solutions to translate new technologies into hospitals and medical practice. Participants will be able to share ideas through collaborative activities during the one and a half day event. “The Think Tank has always been an engaging space for all. It’s an excellent opportunity for people to network, but also get inspired by an interdisciplinary topic with exponential growth potential,” Dr. Williams said. Find out more information about this year’s Think Tank and registration information here. For those of you that are scientists – you want results, right? Cold, hard facts. According to Tiffany Fox, Public Information Representative at the Qualcomm Institute at the UC San Diego Division of the California Institute for Telecommunication and Information Technology (Calit2), the field of social media is just too new to yield results that demonstrate its value for scientists. However, there is evidence that the number of tweets a journal article gets can predict the number of citations it will have – that’s according to the Journal of Medical Internet Research. In a recent seminar designed to instruct Electrical and Computer Engineering students in the art of using social media to communicate research, Fox spent time explaining why it is increasingly expected that scientists and engineers have a social media presence. The term ‘quickly’ might be an understatement – this comic by Randall Munroe explains how it is that tweets travel faster than an earthquake. With so much irrelevant information on the web, the question remains: Which social channels should I be on? It’s a matter of knowing your audience, says Fox. A recent poll found that 65 percent of people under the age of 30 are getting their news from the Internet. In addition, a study found that the potential for an audience at a scientific conference is 10-fold less than for social media. If we know that this is where our audience is, why don’t we use it? Aren’t journals and conferences enough? How many times have you seen a copy of Nano Letters on someone’s coffee table? But that’s what journalists are for! Journalists can get it wrong. The Internet is forever! So are print magazines. Scientists are introverts. Social media is perfect for introverts – you don’t even have to leave the house! Voice your thoughts and opinions…for free. Be part of the larger conversation – not only that, you can sway it. It’s becoming an obligation – you seem really out of touch if you’re not using social media. In fact, I’d wager you’re doing science a disfavor. But, you say, I still don’t wanna! What if I’m wrong? Make a correction. What if no one pays attention? Not participating guarantees even less attention. What if someone yells at me? That means they were paying attention. What if my boss doesn’t like it? Work with your Public Information Representative to find out the rules. Are you convinced? Good. Let’s get started. Fox offers these general guidelines for creating a profile on any one of the social media sites we listed at the beginning of this post. Have a profile picture of yourself – DO NOT use the school logo! Many people have a single type of update that they post regularly, such as a status update or industry news. In fact, Fox says, some people only retweet or share other people’s content. For every four staple updates, mix it up with a different piece of content. The ultimate goal is to create investment. In the end, it all comes full-circle, Fox says. We are using social media to talk about science, and science to study social media. Tiffany Fox will host one more workshop as part of her “Communicating Research: How to ‘Speak Science’ and Be Understood” series on May 19 from 5 to 7 p.m. The final workshop will be titled “Communicating with the Lay Public”. The workshop is free-of-charge and will be held in the Booker Conference Room (Room 2512), Jacobs Hall/EBU1, UC San Diego. You can register here. Alex Phan, a grad student in mechanical and aerospace engineering at the Jacobs School, placed third in the Grad Slam 2015 competition organized by the University of California, San Diego, for his talk about an intraocular pressure sensor. Phan and his team are working with Dr. Robert N. Weinreb at the Shiley Eye Center to develop a sensor that can be implanted in the eye and allow for eye pressure monitoring anywhere. The sensor is coupled with a smart phone to take measurements. He is working in the lab of MAE professor Frank Talke here at the Jacobs School. You can listen to Phan's talk in the video above. It starts around the 27 minute mark. Julie Yip is a first-year bioengineering student at the University of California, San Diego. Born and raised in Bakersfield, California, Yip grew up cooking and baking at her mother’s side which led her to want pursue a hands-on career in engineering – but she quickly learned that the field of medicine also greatly interested her. After attending the California State Summer School for Mathematics and Science (COSMOS), a four-week residential summer program open to motivated high school students with demonstrated interest and achievement in math and science, Yip chose to marry her interests by attending UC San Diego as a bioengineering major. Bioengineering I was such a great experience. The class itself embodied everything I had hoped to expect when I chose to study at UC San Diego. I knew the university offered endless research opportunities and a leading education (especially in bioengineering) but I never thought I could have the amount of exposure that the class offered this early on in my academic career. The format of the class exposed students to a broader and deeper perspective on the possibilities within bioengineering. Bioengineering professors and guest speakers led each lecture, offering students some insight into the speakers’ own specific research interests such as new ways to use electrodes, cardiomyocytes for regenerative medicine and Ebola. In addition, the class was based on three individual, highly interactive group projects: Electrophysiology for Brain-Body-Machine Interfaces; Treatment of Ebola with Limited Resources; and 3D-Printing at Macro-Micro Scales for Organ and Tissue Engineering. You must be thinking about how ridiculously dorky I sound. But, really, that dorkiness is indicative of something very special. The project was not fun solely because we had the opportunity to work with highly advanced technology; the experience was also enjoyable because of the people in my group. My team members were brilliant, driven students – not to mention kind-hearted and easy to work with. And I believe we all shared, more or less, my dorkiness. That is, we were all excited to simply learn. No matter how we got to the class – whether we thought bioengineering sounded like an interesting major during college app seasons or went back to school after graduating and working as a medical professional – we were passionate about what we were doing. I am humbled by them, and I am humbled by my own experience. Watch for more from Julie Yip, and more on the new Bioengineering I course.